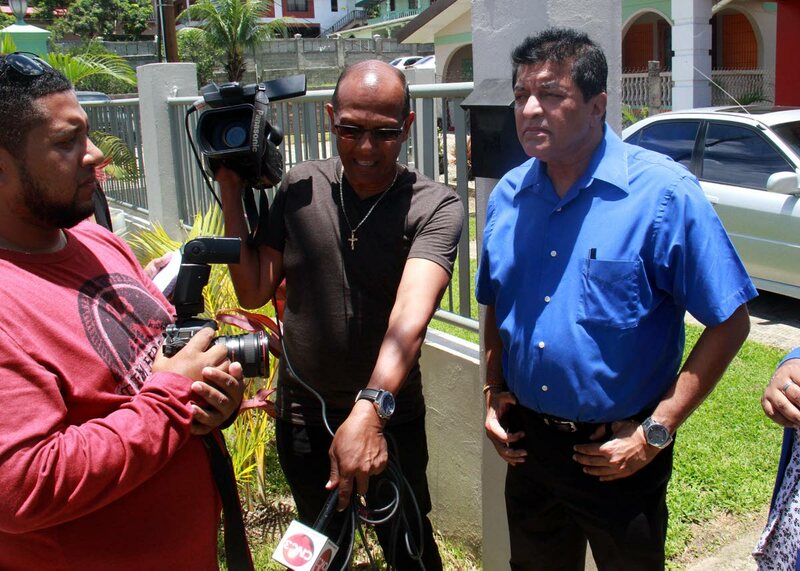 Fyzabad MP Dr Lackram Bodoe speaks with members of the media in front the home of Fyzabad businessman Anderson Kokaram who was shot and killed inside his bedroom on Saturday. A FYZABAD businessman was murdered in his home shortly after midnight on Saturday. Anderson Kokaram, 52, of Delhi Road, Fyzabad was killed by gunmen in his bedroom around 12.30am on Sunday. Police said Kokaram’s wife, who was asleep next him to him, reported hearing a loud noise and seeing two men beating Kokaram in the bedroom. She told police she heard “loud gunshots” and saw the men running off. She alerted Kokaram’s relatives who live close-by and the businessman was taken to the San Fernando General Hospital where he died around 2.30am. Police were told nothing was taken from the house but they are yet to ascertain a motive for Kokaram’s murder. When Newsday visited the family’s home yesterday, relatives were holding a prayer session. Kokaram’s brother, Heathcliff Kokaram said he and other relatives could not speak to the media. Heathcliff said his family was trying to piece together the events of the night before and were advised by police not to give any statements. Newsday was told Kokaram’s only son was not in the country as he is studying at a university abroad. MP for Fyzabad, Dr Lackram Bodoe visited the family around noon yesterday. Bodoe said Kokaram, who owned a Lotto booth and a supermarket in the area, was an upstanding citizen. “Mr Kokaram is a long-standing businessman in this community and he had a reputation of being an upstanding citizen in Fyzabad, this is a tremendous shock to the community especially in this Delhi Road area,” Bodoe said. He called on newly-appointed National Security Minister Stuart Young to give new Police Commissioner Gary Griffith all the tools he needs to combat the escalating crime rate. Reply to "Businessman murdered at home"